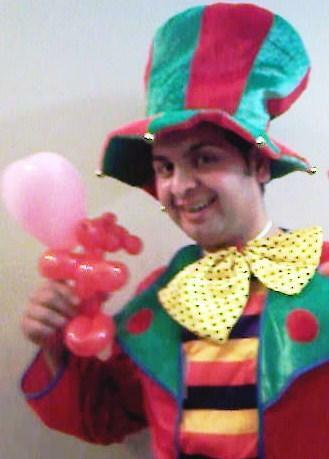 Rabbie Khadim is a professional children's entertainer based in London. He caters for a wide selection of events including private childrens parties, corporate events, launch parties, funday events, clubs, childrens groups, schools parties in fact all sorts of events ! As a CHILDREN'S ENTERTAINER, he can dress up as a clown or in brightly coloured clothing. Children often enjoy the clown look, which looks much better in the family photo's. As a fun MAGICIAN, he performs safe, colourful close up magic and likes lots of audience participation, everyone loves to see a trick close up, to wonder about the mystery of how it was done, young or old, they're all amazed by his magic. As a BALLOON MODELLER, Rabbie does many different balloon models, he even brings along extra balloon pumps so that the kids can blow up their own balloons and 'have a go' at being a balloon modeller themselves ! They love it !